Studio Spicer has been granted planning permission for this contemporary replacement dwelling scheme located near the village of Beausale, Warwickshire. The existing site comprises a smallholding of 1.5 hectares with a number of low-quality buildings arranged in a piecemeal fashion that lack synergy with one another. The proposed re-development comprises a replacement 4 bedroom dwelling, ancillary domestic annex, and flexible commercial unit all designed to suit the specific and anticipated future needs of our client and their family; and with a consolidated built volume, footprint and rationalised site layout within this open countryside location. The proposals also incorporate significant ecological and biodiversity features to promote and support identified protected species and native flora and fauna. 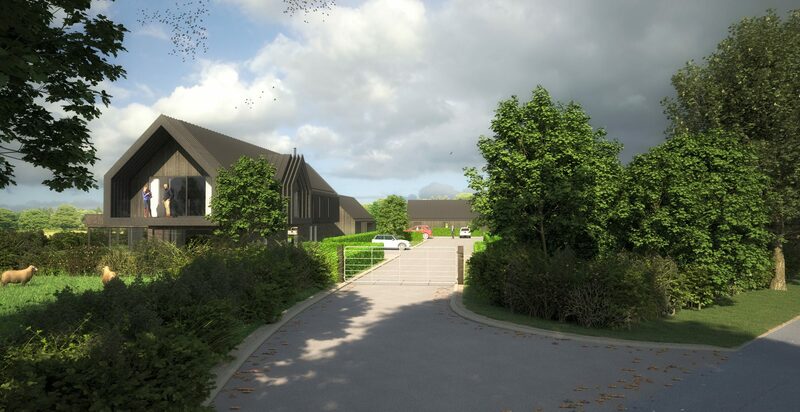 The application was recommended for approval by Warwick District Council Planning Department and was granted planning permission unanimously by Planning Committee. Construction is anticipated to commence later this Summer.